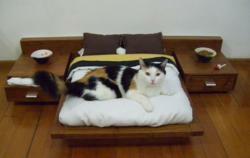 While most pet owners would agree that $1,600 for a cat bed is excessive, designers Cedel Pets & Style unveiled this expensive furniture in April 2012 to cater to the needs of their most affluent buyers. Marketing expert, Charles Gaudet, founder of PredictableProfits.com notes that while price might disqualify the average buyer, the growing affluent community is less concerned about price and more concerned with having their needs met. He says, "There’s a tremendous opportunity that exists when you begin to focus on ‘who’ you are marketing to instead of ‘what’ you are selling." Wealthy consumers have been known to spend top dollar for high quality amenities. Victoria Beckham made headlines in 2007 when she spent $50,000 on a tree house for her sons. In March of 2012, Kobe Bryant wrote a personal check to buy a $329,000 Ferrari and Paris Hilton made news for buying a $55,000 dog collar for Tinkerbell, her beloved Chihuahua. 1. Stress unique factors. What separates this product from its average counterpart? 2. Price is not the focus. How will the product or service improve the customer's quality of life? Does it offer speed, experience, comfort, beauty or perhaps stroke the ego? 3. Focus on service. What extra amenities, bundled services, VIP packages, etc. are available with the product? 4. Does the product (and related marketing) reflect an affluent lifestyle? Gaudet reminds marketers that, "With marketing to the affluent, the focus must always be on the primary benefit, and never on price. Affluent consumers are not motivated by the most affordable, they buy because they are the best available. Marketers need to effectively leverage the best aspects of their products in order to impact the buying decisions of these affluent customers." For more insight from expert marketer, Charles Gaudet, and his the Predictable Profits stratgies, please visit http://www.PredictableProfits.com and sign up for the free newsletter. ABOUT CHARLES GAUDET: Gaudet started his first business at just four years old, and has been involved in entrepreneurial enterprises ever since. Upon finding himself in millions of dollars of debt and under enormous stress at the age of 24, he and his wife systematically grew their first multi-million dollar company. Gaudet has traveled much of the world studying from business, political and social leaders studying entrepreneurial, marketing and business excellence. He is widely regarded as a marketing expert for consistently delivering windfalls of profits to his clients, unveiling opportunities that have been previously under-utilized or have gone unnoticed. ABOUT PREDICTABLE PROFITS: Predictable Profits is a leading small business marketing company and a division of Managed Marketing, LLC. The company specializes in finding overlooked marketing opportunities commonly found in most small-to-medium sized businesses, and creating actionable marketing strategies for increasing a company's profits. You can read more about Predictable Profits by visiting the company's website at http://www.PredictableProfits.com.